North East Accounting and Bookkeeping | What happens when introverts and extroverts clash! I work 2 hours a week teaching enterprise skills to students at Northumbria University. I always try to teach them something taken from the real world of business. This week we had a fantastic guest lecture by Rob Gwyther from Accenture. He looked at team working and one aspect of particular interest to me was Myers Briggs. With this in mind, I came up with an exercise for the students which is something you can use in your own teams over a lunch break. I used a simple PDF test which you can find here. This test allowed me in 5 minutes to divide the students into introverts and extroverts. I then seperated the introverts and extroverts into teams made up exclusively of introverts or extroverts. 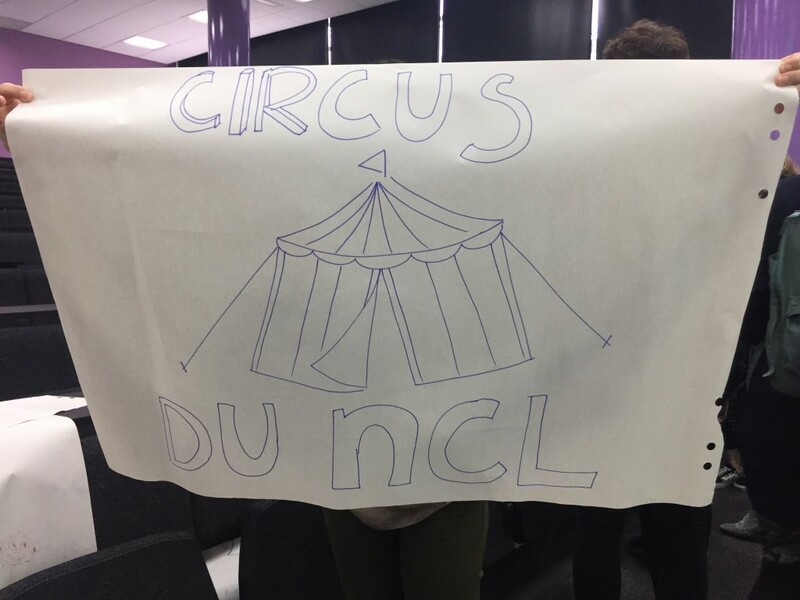 I gave each team an A1 piece of flip cart paper and a selection of pens. 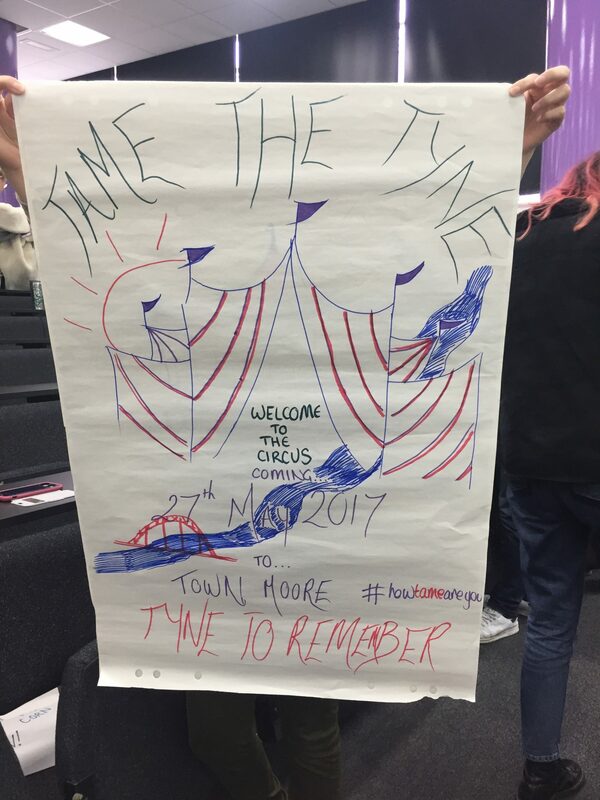 The task was simple, to draw a poster advertising a circus coming to town. So what happen next and what does this tell me? During the exercise there was a clear difference between the teams. One team had all 5 team members drawing on the poster at the same time. Orders were being barked about what needed to be put on the poster. Text went in all different directions. Different colours were used and who did the drawing caused a little friction at times. Two of the groups decided to move to the floor area so everyone could pitch in. They struggled to stick to the deadline and were the last to finish the exercise. The end result was a mash of colour, big text and flamboyant design. Decisions regarding the poster were decided collectively and politely. Only one or two colours were used. On the whole one person was in charge of drawing and writing. Interestingly all the text remainder the same direction and at times too small. The drawings were neat and much tidier writings on the poster. All the extrovert groups finished well within the time limit. These are just my observations during the exercise and I’m by no means an expert on personality types. However, there are clear difference in the groups. So why is this important and which type of person is best? So are extrovert better than introverts? Of course not! What is important to realise is that your team is likely to be made up of both introverts and extrovert. They have different skills and ways of approaching things. If you have a marketing poster to design some extrovert flair might be useful but they could get carried away with the ideas. They might be outspoken in meetings when presenting ideas and may struggle to listen to other people’s ideas. I had a really strange meeting on my travels consulting with a client which illustrates this perfectly. I went to a meeting where the client was struggling financially. In particular one department was underperforming. I called a meeting with the two managers. Before we’d even sat down John turned to me and said, “Justin, I can tell you what the problem is, all the staff are lazy and have no motivation.” The meeting continued along these lines, meanwhile, Susan the other manager said very little in the meeting and in fact contributed nothing. Why did I ask her after the meeting? As an introvert I know this personality type can struggle with confrontation and tend to be more private. This tactic paid off as John had told me everything but Susan had given me the answer. I’m not sure directly questioning her in the meeting would have yielded the result I needed. Over the last 10 years running a business I’ve learnt all kinds of things about me. I’m a fantastic starter but cannot finish anything, I have a fantastic team who are trained to clear up my carnage. But, the organisation would never move forward without me being this personality. This can be measured using a test called Belbin. I was fortunate to not only do a Myers Briggs test but I was assessed by a phycologist as part of this process and then worked in teams to discover how each personality trait worked in reality. It was possibly the best experience of my working life. All of a sudden I started categorising clients, friends and employees into personality types. I knew what made them tick and it made me better at getting the most from people. By understanding me as a person meant I could read and understand others better. The world was all of a sudden a different place. The poster exercise I did with my students is fun and a great team building exercise for any team. The added bonus is you get to understand everyone better. – Do the Myers Briggs test online over a lunch break with everyone and then talk about it after. – The Belbin test is a great exercise to do in a team and can be quite fun. Someone who never finished that project comes out as a starter, this can be quite funny and build better understanding. – Try to guess someones personality type and then get them to do the test. – As you go around your every day business try really analysing people. Try different approaches to questioning and see what result you get. – Categories your clients into what drives them. Accenture do this with all their clients in order to get the best results, they watch and learn. Customer loyalty is paramount and they realise understanding a customer means they can present information in the most appealing format. In business your biggest overhead is likely to be the staff cost so spending an hour using a simple exercise or test could help no end. Your team will understand each other better, they are likely to bond, managers get to understand the team and the staff get to understand the managers.